I have been on a bit of a quinoa kick lately. Making it way more often than rice! Cinnamon Walnut Quinoa, plus a Curried Chicken Quinoa that I’ll be making this week and a Spicy Southwest Quinoa that I’ve got on the calendar to share soon! With a side of “Guac de Gallo” if you will. In a medium saucepan, cook the quinoa in the 2 cups of liquid, as directed on the package. As it nears it’s cooking time (after about 15 minutes), stir in the diced tomatoes undrained and the black beans. Add the ground cumin and the lime juice. Continue cooking for about 10 minutes, or until any remaining liquid cooks off. Season with salt and pepper to taste. 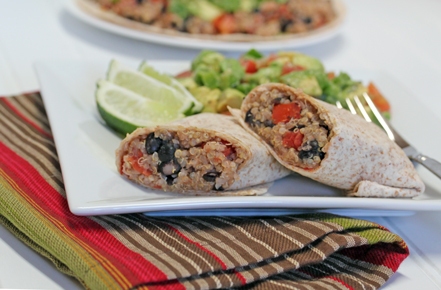 Spoon into warm tortillas, roll and eat. If you want a little zing in your burritos, use Rotel diced tomatoes with green chilies in place of the diced tomatoes. In a mixing bowl, combine the avocado, tomato, green pepper and add some ground cumin, chopped cilantro, lime juice and salt and pepper to taste. Option #1: Serve the “guac de gallo” on the side. 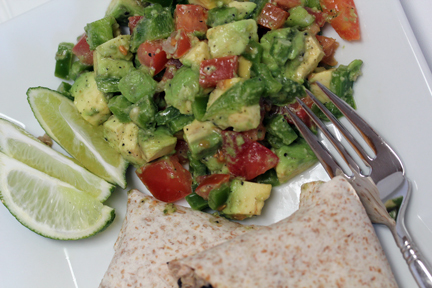 Option #2: Serve the “guac de gallo” inside the burritos. Either way, there won’t be anything left on your plate! I hate to admit it, but I have never had quinoa. I’ll have to give it a try. These are terrific! And quinoa is a great source of protein, unlike rice. These would be great for a low-carb meal or if trying to increase protein intake in kids. Thanks for the recipe! My recipe has quinoa and avocado too! They’re two of my favorite foods, I think. …And from the looks of the link-up, it was Tex-Mex night for most of us! I love anything in a wrap! Thanks! Not sure where in the world you buy peppers and quinoa that is that cheap. A few cups of quinoa is $5.99 at the store and a pepper is AT LEAST $1.. $2 for a red pepper. I would like to know too, I love quinoa but it’s super expensive! The price was always a concern. I would like to know where to buy.